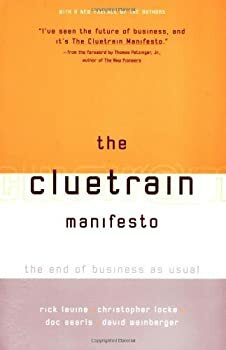 The Cluetrain Manifesto: 10th Anniversary Edition by Rick Levine, Christopher Locke, Doc Searls and David Weinberger is one of those books where you are being given a message. And what is this grand and glorious message? It is this: Markets are Conversations. Yeah, that’s it. Oh and by the way, markets are conversations. You just told me that. Yeah, well, they are. Did I mention that markets are conversations? Oh and by the way, marketers and PR people are mean and nasty and awful. And they and other typical business people are a vaguely (and not so vaguely) sinister stereotype. Whereas all of the people (somehow, there are no details of who these typical business people and PR personnel are) are righteous, pure, just and true. They are individuals and deserve to receive our communication, and our undivided listening attention, like all individuals. Like, uh, I’m unique, just like everyone else? No, no, no! You’re a unique and wonderful and special personal with marvelous gifts and enormous accuracy in understanding good and positive and possible markets. And you do it all while making fun of typical business people who obviously not only do not have a clue but are also, let’s face it, heartless, cold, inaccurate, not listening, not worthy of the time of day or a significant study. And otherwise they should be ignored and forgotten, left to die on the vine. But me, I’m a marketing type. The kind you said was evil. So you are. Well, you’re evil, then. You don’t even realize that I get it, this thing you are talking about, this point you keep dancing around as you keep beating the same old tired drum. Markets are conversations! Okay, great. I get that. And I have read it before although, in fairness, it was likely copying you. But after that – and after repeating this mantra at least a good 16 or so times in your book – what else have you got to say, other than that the creature known as Business as Usual needs to die? Fine, I get that, too. I’ve worked in traditional corporations, and I know that the work there can feel soul-killing. But at the same time, there are people who thrive in such environments, people who seem pleasant, intelligent, respected and even, at times, hip. But, but, but, those people are supposed to be like Richard Nixon in wingtips on the beach, so cluelessly out of tune with everything that they cannot possibly be reeled in. Reeled in, to the Cluetrain way of thinking? And at some point, and of course I am exaggerating, but the bottom line is, the book decries business as usual and stereotypical thinking, yet it turns right around and stereotypes the very people who it claims need to change the most. That is, of course, a lovely and time-honored way to get people to listen to you and change their methodologies to your way of thinking: make fun of them and make them feel small. So somewhere along the line, Cluetrain feels like it lost its way, like it cannot figure out how to be brief. Like it cannot comprehend that talking down to people – while it criticizes business as usual for talking down to people – is more than a little ironic, and that they are not on the happy end of that irony. Like it has almost become the very thing it says not to be: a business method and rule and playbook. There are interesting observations in here, to be sure. But overlong tales of this, that and the other diverting digression bog those observations down. The Internet is full of people who are spouting and selling hokum! Yes, well The Refreshments said that before, and better: the world is full of stupid people. This is not, sadly, news. Oh and big business is not nimble and providing individual attention is lovely and wonderful, but hard to do if you’re very large and/or if the number of individuals you’re addressing is huge. This isn’t front-page material, either. There is one nugget of interest: when you’re dealing with said enormous number of individuals, you generally don’t need to address them all as individuals – you just need to work with a few and the others will see that you care about individuals. And you’re pretty much set there. This makes sense in a Groundswell (a far better book, in my opinion) sort of a way, in that there are more people online who are reading and lurking versus writing or critiquing, so a message to one can be like a message to a thousand.